Cordelia Johnson Service Details - Accomac, Virginia | Cooper and Humbles Funeral Co., Inc.
Cordelia Louis Johnson, the daughter of the late Bertie Elizabeth Harris and Clinton Rue who raised her as his own, was born April 2, 1953 in Bridgeton, New Jersey. “Minnie,” as she was affectionately known by family and friends, transitioned from her earthly home to her heavenly home on Sunday, October 28, 2018 at Riverside Shore Memorial Hospital, Onancock, Virginia to be with her Lord and Savior. Cordelia attended Accomack County Public Schools and was a graduate of Atlantic High School. She worked at various jobs until her health failed. She was a faithful and dedicated member of Mt. Zion Independent Methodist Church in Withams, Virginia even during her illness. Minnie never complained and continually thanked God for each day. She was a trustee, an usher, and a member of the choir. Minnie enjoyed singing and praising the Lord. Minnie was preceded in death by her sister, Beatrice Harris. Minnie leaves behind four daughters, Shelia Johnson, Melissa Johnson, both of Pocomoke City, MD, Almeda Johnson of Tasley, VA, and Beverly Palmer of Virginia Beach, VA, who she raised as her own; one sister, Mary Ann Holden of Trenton, NJ; one brother, Sylvester Johnson of Atlantic City, NJ; five grandchildren, Rhonda Johnson of Parksley, VA, Ryheem Johnson of Bowie, MD, Demar and Danequa Johnson of Norfolk, VA, and Jykane Johnson of Tasley, VA; four great-grandchildren, Koresha Johnson, JaShon Northan, RyShon Northan, and Tisha Northan, all of Parksley, VA; and a host of nieces, nephews, cousins, and friends who will miss her dearly. 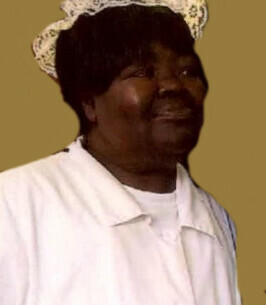 To send flowers to the family of Cordelia Louis "Minnie" Johnson, please visit our Heartfelt Sympathies Store. Elder Michael O. Press, Sr.
We encourage you to share any memorable photos or stories about Cordelia. All tributes placed on and purchased through this memorial website will remain on in perpetuity for future generations. I am sorry for Ma Minnie's passing, I only knew her a short time but in that short time I grew very fond of her. I know she will be greatly missed. May God give you all comfort and peace. Minnie's loss of life is a loss to us all! Family and friends can be helpful in coping with such a void! I have found comfort by reading various articles from jw.org>Bible Teachings>Life and Death>Hope for the Dead>What is the Resurrection? I want to express sympathy and comfort to all missing Minnie.